Animal Feed Supplement, Inc (AFS) is a wholly owned subsidiary of Carr’s Group plc, acquired in 1997 and established in Poteau, Oklahoma. Shortly after the acquisition, a second manufacturing location in Belle Fourche, South Dakota was established as to service customers in the northern and western states. In 2013 a third plant at Silver Springs, Nevada was acquired expanding the geographical reach in the USA. AFS operate under the trading name New Generation Supplements. AFS manufactures SmartLic® supplements and the Feed In A Drum labelled products, which are university research proven to provide livestock nutrition throughout the entire production cycle. These low moisture blocks are nutritionally engineered to optimize forage utilization and reproductive performance. 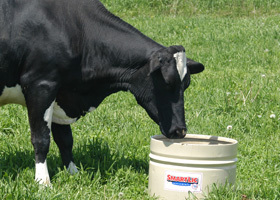 SmartLic® supplements are designed to be fed with all types of pastures or forages.